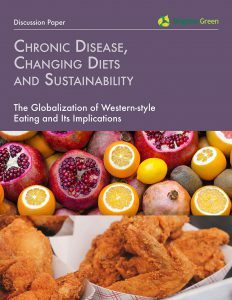 To mark World Food Day 2017, on October 16, Brighter Green released a new discussion paper, Chronic Disease, Changing Diets and Sustainability: The Globalization of Western-style Eating and Its Implications, that illuminates the public health and environmental challenges created by the rapid adoption in Africa, Asia, and Latin America of diets high in fats, sugar, processed foods, and salt. Fueled by the growth of industrial agriculture, trade agreements, marketing, and the power of “Big Food,” global plates are becoming more like those in the U.S. – and, as a result, less healthy, less sustainable, and less equitable. Five country case studies (Brazil, China, Mexico, South Africa, India) provide cautionary examples of how an increase in non-communicable diseases almost always accompanies a changing food environment. The paper was written to help accelerate action on the critical intersections of diet, health, and the environment. Chronic Disease, Changing Diets, and Sustainability offers concrete proposals for policymakers, public health professionals, educators, and individuals in both the global South and the global North. These include changes in fiscal measures, stronger regulation, redirection of agricultural subsidies, a rethinking of health systems, shifts in international development priorities and funding, along with increased public engagement. The paper also calls for policymakers to expose the nutritional deficiencies and unhealthy excess baked in to the standard Western diet and invest instead in food systems that truly work for people and the planet. Author Judy Bankman penned an article for China Dialogue on November 27, 2017 based on the discussion paper (shown here in English and Chinese). In 2013, Brighter Green Research Intern Judy Bankman wrote a blog series on the public health impacts of the globalization of the Western diet in the global South. These blogs are a part of the Brighter Green Public Health Project, a project that aims to investigate how the adoption of the Western diet (diets higher in animal fats, sugar, salt, and processed foods) in the global South (developing regions) is contributing to an increase in non-communicable diseases (NCDs) such as diabetes, obesity, and cardiovascular disease. Photo courtesy of Jun Li/Flickr. During the last several decades, many countries throughout the world have seen a spike in obesity rates and chronic diseases such as cardiovascular disease and diabetes. While various factors contribute to this trend, the largest factor is the influence of the standard American diet: high in animal fat, sugar, and salt, with steadily increasing portion sizes and ready-made, processed meals. The standard American diet is making Americans sick, and its exportation to the global South is fueling an increase in diet-related non-communicable disease. These chronic diseases disproportionately affect low and middle-income countries as many are currently witnessing a quick rise in incomes and an equally quick transition from traditional plant-based diets to the standard “Western” fare. The blogs below, originally appearing on the Civil Eats website as well as the Food Tank website, provide country-specific examinations of the nutrition transition as well as the influence of junk food marketing in developing countries.